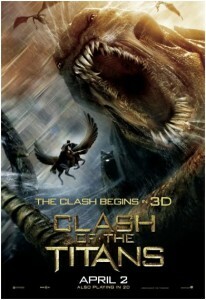 Clash of the Titans is a fun movie to watch. If you are a fan of giant monsters, swords and sorcery, damsels in distress fun action type of movies then this one is for you. If you go expecting great story and a critically good movie then this will fall short. If you are planning on taking the kids this would be a descent movie. There are no major language or overt sexual references. Clash of the Titans should be called Earthdawn the Movie. They have a human lead character aided and guided by the passion Garlan. The antagonist is the named horror Nemesis who summons other horrors to stop the lead. The other antagonist is a dishonored Troll who teams up with Nemesis and corrupted by him. As a fan of Earthdawn it's a fun way to look at the movie. Now all we need is for Redbrick to step up their game and make more Earthdawn movies. A retelling of the 1981 film Clash of the Titans . Born of a god but raised as a man, Perseus is helpless to save his family from Hades. With nothing left to lose, Perseus volunteers to lead a dangerous mission to defeat the Kraken and then get revenge on Hades. Ralph Fiennes and Liam Neeson steal the show. I just wanted to follow them rather then go back to the story. Wire work was obvious with no sense of gravity or weight to the characters. Sword Play choreography has some glaring issues. Major logical inconsistencies both with the story and in the characters.